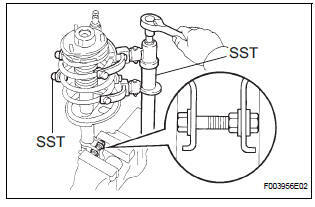 (a) Install 2 nuts and a bolt to the bracket at the lower side of the front shock absorber with coil spring and secure it in a vise. NOTICE: Do not use an impact wrench. It will damage the SST. HINT: Use 2 SST of the same type.